The Berkeley Marina address is 201 University Ave. Vehicle parking in the marina is $20 for the day ($50 for large vehicles) or ride your bike over the Berkeley bicycle overpass and use the free valet parking provided by Spokes near Adventure Playground. 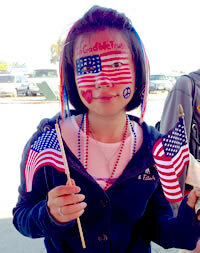 Or join the people parade by walking into the marina over the overpass. 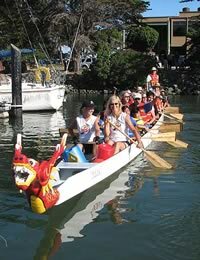 Take AC Transit #51B from the Downtown Berkeley BART station and into the marina until 6PM only. To leave on AC Transit after 6PM, walk out over the freeway overpass to University and 5th St.
Free admission. Alcohol-free event. Sponsored by the City of Berkeley, Berkeley Community Media, 7x7, East Bay Loop, The Express. Live entertainment on several stages delights kids and adults as well. Dance near the main stage to Guarandinga (7:30-9:30PM) led by singer Rowan Jiménez and bassist Jeremy Allen, as they perform a signature style of Latin Afro-Pop that integrates hip-hop, rock, and Venezuelan folklore with gritty East Bay funk. They’ll get you out on the dance floor! Idlewild West (5:15-7:15PM), an Allman Bros. tribute band have been playing in rock, blues and jazz bands for many years. With Mike Green on vocals, Tim Peck on slide and lead guitar, Chris Planas on lead guitar, Ric Perez on Hammond B3 and piano, Rob Waxman on bass, and Bill Swanson on drums, they have fun on stage and want you to feel the enjoyment as well. Eat a peach for peace! Little David Rose's thumpin' stand-up bass, the double-shuffle drumming of Lee Beary, and the bounce piano of Scott Lawrence provide the rhythmic foundation of Stompy Jones (3:15-5:00PM) jump style. Riffing on top is the guitar sound of Allen Jackson and Jeff "Erv" Ervin on the saxophone. These two fellas create the fireworks of vintage rhythm and blues. The charming vocals of Glen Walters have become a trademark of Stompy Jones. Troupe Tangiers and Sharifa's Habbibis (12:00-1:15PM) recreate traditional dances from North Africa, Turkey, and the Middle East regions. Their joyous celebration of women's bodies through the ancient art of Belly Dance are created and directed by the talented dancer and teacher, Sharifa Ohanesian. Tucked into the southeast corner of the park is an Afro-Cuban drumming circle put together by Sam Siegel. It’s a great afternoon of drummers performing on the point south of Cal Sailing Club. As their rhythms carry out over the water delighting the windsurfers, you can dance along side their group. While you’re enjoying the tastes of summer, visit the Food Court Performing Area and be delighted by Golden Lion Martial Arts (1:00PM) when students of traditional martial arts perform disciplined kicks, punches, and sparring. The Merry Mary Show (2:00 + 4:00) features comedy, juggling, pantomime, and magic with a one-of-a-kind pole walking finale! Mary entertains people of all ages with her cute 90 pounds of audacious pluck! Failure to Disperse (3:00PM) finds Carol Denney, James Nelson, and Steven Strauss playing old time and folk music on acoustic instruments just as they were played in the days of yore - or even today! Come sing with them! A true artist in every sense of the word, Sean Lee: A One-Man Band (5:00PM) is a seasoned performer of both street and stage, recently returning from his third solo US tour. Simultaneously playing banjo, bass drum, and tambourine, his one-man band get up was decades in the making. It is guaranteed family fun. California-based songwriters of Bay Station (6:00PM), Kwame Copeland and Deborah Crooks, combine their talents to create a diverse form of Americana music. Singing songs about love, lust, sandy beaches, dusty roads, wolf birds and more, they recently released their third record, Other Desert Cities. And the food… all kinds of faire food stalls and gourmet food trucks... key lime calamari to hand-dipped corn dogs, BBQ oysters to organic ice cream, cobblers to kebabs...something for every palate. Tons of fun to be had includes live pony rides, carnival rides, an inflatable bounce area, mini-train rides, a giant wavy slide, and walk-on-water bubble balls. Get your face painted, a henna tattoo, or a balloon animal. Hand made and international craft vendors make a bit of shopping therapy available. 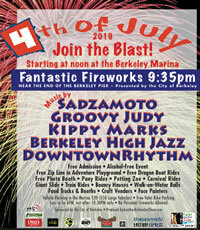 The day culminates in the grand fireworks over the water near the end of the Berkeley Pier at 9:35PM presented by the City of Berkeley. Viewing is best along Seawall Drive south of the Pier or from Hs Lordship’s parking lot. Be sure to get some light-up swag on your way to the viewing area so you, too, can sparkle. No Vending, No Food Sales, No Glow-in-the-Dark or LED Product Sales in the entire Marina on July 4 unless you have a special event 4th of July permit from the event producer.